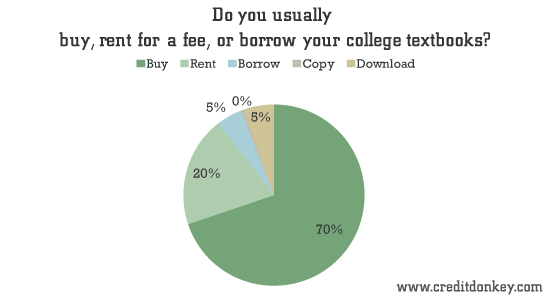 Almost half of college students use credit cards to buy or rent textbooks, according to a new survey conducted by CreditDonkey.com. 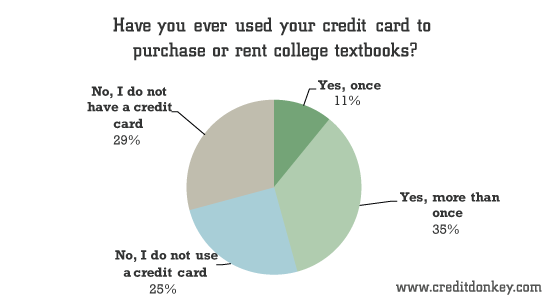 Over a thousand college students were asked if they used a credit card to purchase or rent a textbook. 45.7% said that they did, and 34.8% said that they used cards habitually to pay for their books. 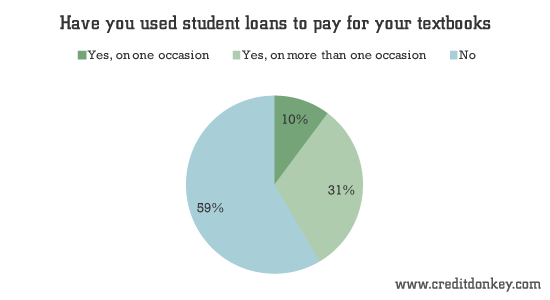 Students are also using student loans to pay for their textbooks. 41.5% said that they had used their loans to pay for the books, so even those who avoid credit cards are still relying on debt to pay for their supplies. 29.2% of the students said they did not own a credit card, and 28.1% said that they have never even applied for a credit card. Over half spend $100 to $299 on textbooks per semester. 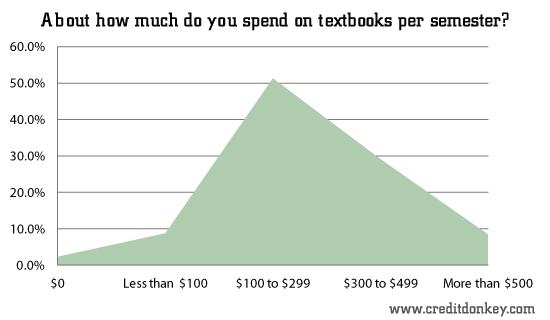 More than 1 in 12 spends over $500 on textbooks per semester. "Student reliance on credit card and student loan debt to pay for more than tuition is further evidence that the increase in college expenses remains unsustainable," says Charles Tran, founder of CreditDonkey.com. "College tuition and fees have increased far greater than the inflation rate for food, shelter, and other consumables." 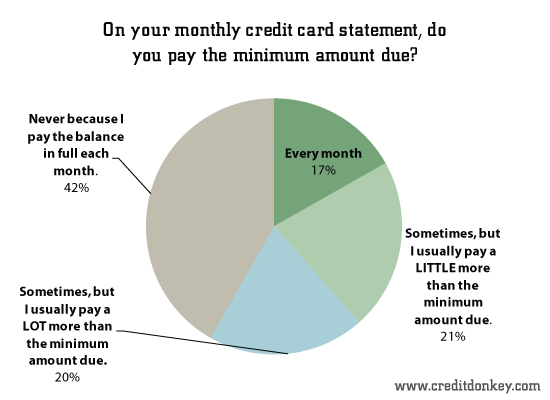 In fact, some 58.2% of respondents with a credit card carry a balance. "Even medical care, a rallying point for inflation hawks, has risen less," exclaims Tran. "In other words, the cost of getting a college education is more expensive than the cost of getting health care." At-need students can qualify for assistance such as the Pell Grant, but that program has faced the chopping block in recent years as the federal government cuts costs. While the maximum award has not been lowered from $5,550, a pending bill would slash the amount of aid to $4,705 per year. 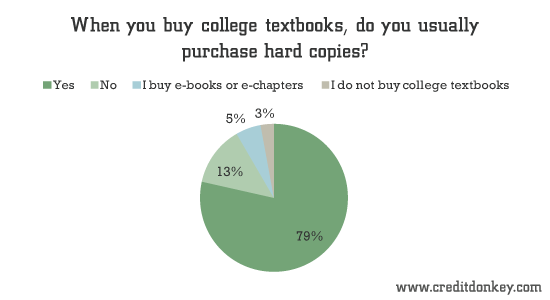 Buying textbooks is still significantly more popular than textbook rentals, with nearly 70% of students saying that they usually buy their books. Most students also buy their books online. 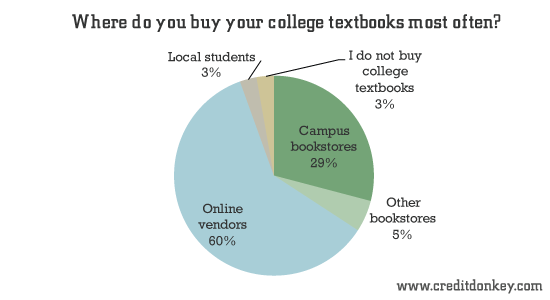 60.3% of students usually buy this way, as opposed to 29.1% buying on campus and 5.1% buying at other bookstores. Although the books are bought online, hard copies are still the most popular: 78.6% of students usually buy hard copies, as opposed to e-books. 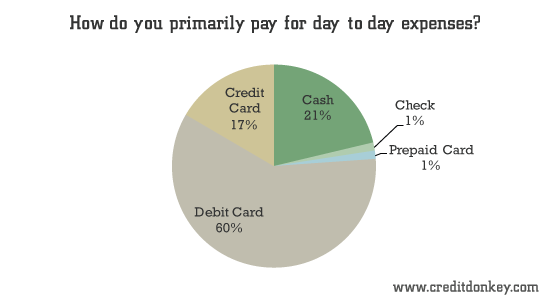 Nearly 6 in 10 primarily pay for day-to-day expenses with a debit card. One in 6, some 16%, pays with a credit card. 37% did not know credit card debt could be wiped out in bankruptcy. CreditDonkey.com conducted the online survey of 1,041 college students from August 2 to August 27, 2012. Share on Facebook "Survey: Students More Reliant on Credit to Pay for Textbooks, Necessities"